[toc]Are you someone who is facing the problems of puffy eyes? Are you aware what negative impacts this can have on your appearance and beauty? If yes, then the first step to the treatment process is to know why exactly you are facing the problem. Knowing about the causes will help you take the right direction of cure to get more than expected results. Stress can be one of the major reasons that lead to puffiness in the eyes along with lack of proper rest and sleep. There are innumerable other issues that can lead to this beauty crisis. However, the good news here is that along with uncountable reasons why you have puffy eyes there is quite a long list of remedies that can help you treat the problem smoothly and efficiently. You might definitely be feeling tired and old looking at those puffed up eyes in the mirror but do not lose hope. This guide below is the exact need of the hour when it comes to this condition. It has some top notch and highly effective treatments for getting rid of puffy eyes in a couple of days. Many of them also prevent the issue from re occurring. There can be nothing better than going for an internal treatment well before the external remedies. By improving the body functions you are working towards a direction where you might get rid of the puffiness permanently. Herein, it is important to add loads of nutrients to the diet plan in the form of vitamins, minerals and especially antioxidants. The latter is one of the boons for the skin and treats all the problems related to it. Look for foods that have high levels of antioxidants in them including fruits and vegetables. Apart from this, the other side of the coin states that one should completely stay away from skin trouble causing foods like oily foods, spicy foods and fried items. These can worsen the condition of puffiness and hamper the treatment. These treatment ideas will have lots of other benefits attached as well. Water, plain and filtered is one of the top ways in which the skin can be refreshed and rejuvenated. Not only does water helps in cleaning away the dead skin cells but also improves the blood circulation in the area. Water helps in flushing out the dirt and bacteria from the skin and leaves behind a glow on the face. Apart from that, water is known to treat inflammation considerably. 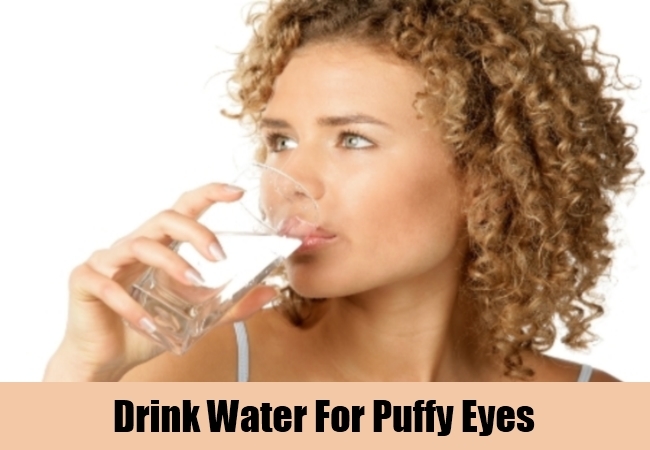 This means having about 8-10 glasses of water each day will get you rid of the puffiness that is causing so much unattractiveness and discomfort. Apart from that, you can have fresh fruit juices, coconut water and herbal teas to enhance the results to a good extent. Usually the puffiness is because of water retention in the area. Drinking water will push it out and treat the issue considerably. Take a steel spoon and refrigerate it for a while. Now apply this on the puffiness under the eyes. A cold slice of cucumber can also help along with a chilled bottle of water if applied directly on the area. Herein, you need to close the eyelids and keep any of the above mentioned products for about 10-15 minutes. 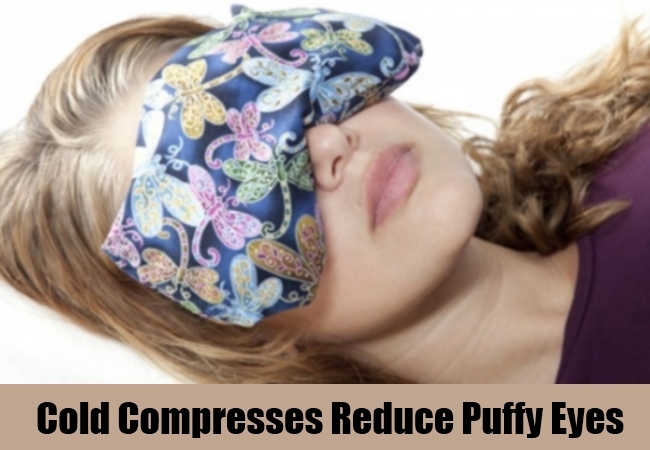 Use this cold compress remedy several times in a day on the puffiness to get perfect results. Green tea bags can also be brewed in warm water and then refrigerated before using under the eyes for the treatment. These are 100 percent safe and free from side effects for maximum benefits. Taking the right amount of rest and sleep is very important in a case where you are experiencing a lot of puffiness in the eyes. About 8 hours of sound and undisturbed sleep is very important if you want to treat the issue. Herein, you can also take naps and rest at regular intervals. This is going to give you a result that you always desired and make your face look refreshed. Sleep deprivation is a common cause of puffiness in the eyes. 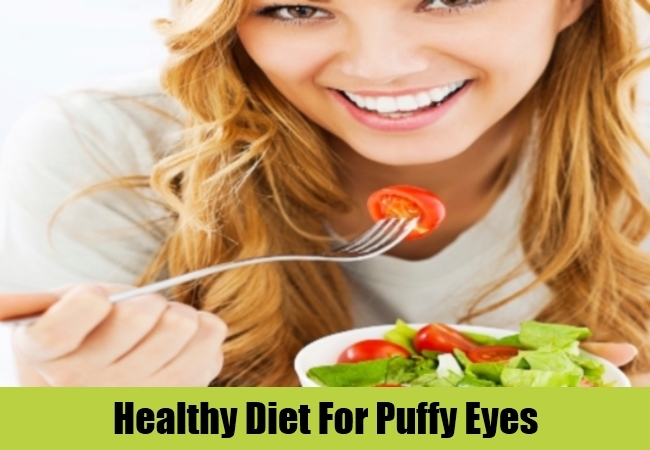 If you are some who is experiencing puffiness in the eyes more than frequently, then it can be a reason that the salt intake in the diet is very high. 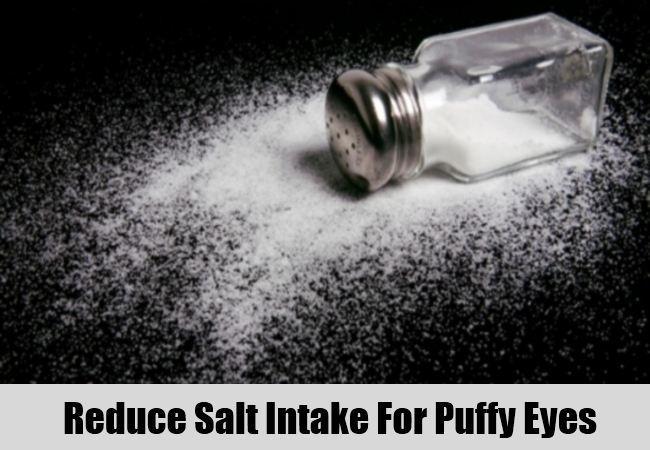 Salt is one of the major reasons that cause water retention under the eyes that leads to puffiness. Reducing the salt in the foods is one of the effective ways for the cure of puffiness. Go as low as possible and see how well it leads to good results and helping you fulfill the goals. There are some foods that ease out the alleviation of fluid retention in the body. By including foods like bananas and raisins in the regular meals will give you healthy and safe results. 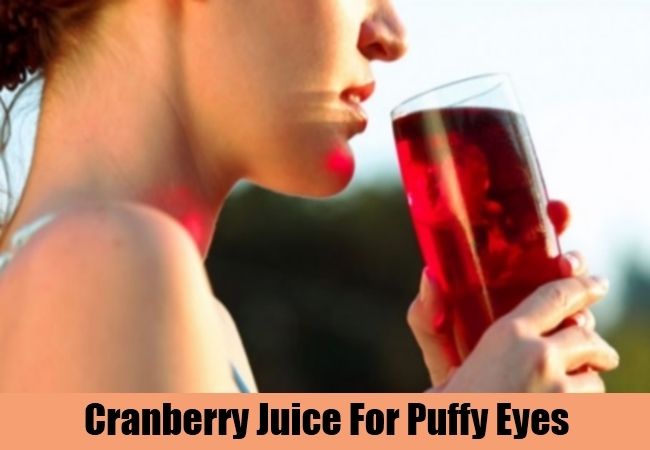 Cranberry juice which is sugar free and cabbage juice can also be a part of this list. It helps in flushing the water retention. On the other hand, caffeine should not be consumed which will only bring back the puffiness. It also dehydrates the skin and worsens the situation of the under eye skin. 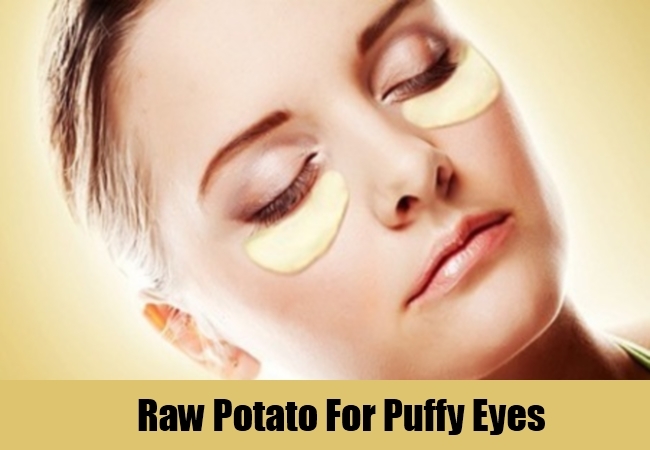 A slice of raw and freshly cut potato can be applied on the eyes for about 10-15 minutes each day. This rejuvenates the skin as well as treats the under eye puffiness. Apart from that potato juice is known to treat the dark circles as a dual benefit. Make sure you use the idea each day until the problem is completely at bay. 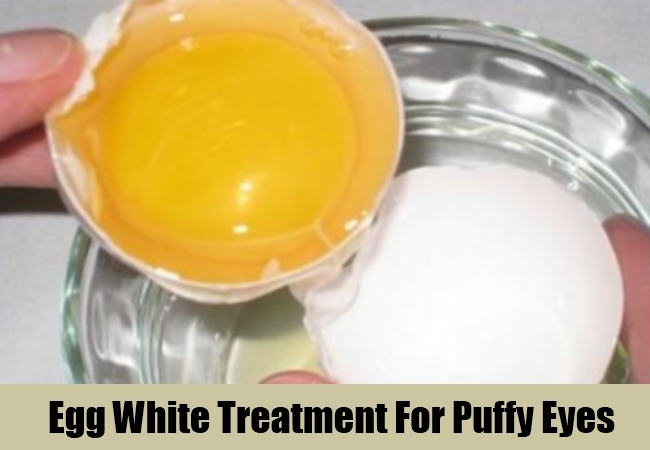 Whisk an egg white and apply this paste under the eyes to tighten the area. This will reduce the puffiness that is causing so much harm to your appearance. This should be kept for at least 20 minutes to get best outcomes. The face should be rinsed with cold water after the application to get ideal outcomes. 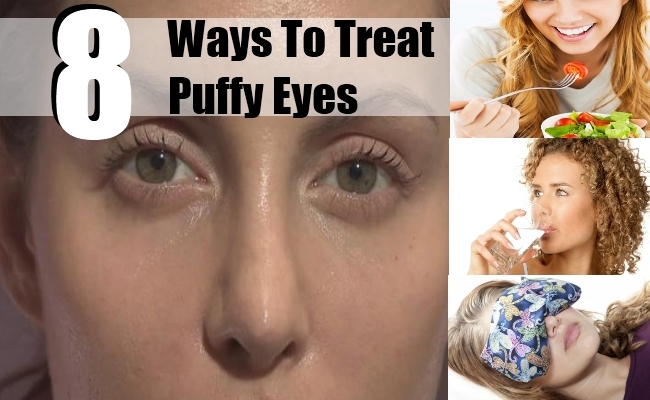 These remedies will help you a long run in getting perfect results for the treatment of puffy eyes and that too in an affordable manner.